Tour the Historic Compton Hill Water Tower during the Full Moon of each month. View the full moon from the top of the historic Compton Hill Water Tower. Each month, March through November, on the night of the full moon, the Water Tower is open to the public. Visitor can climb the 198 step spiral staircase to the top of the 179-foot tower to take in the incredible view of the full moon as it rises and a 360 view of the city of St. Louis. A $5 (cash) admission fee is charged; children 5 and under are free. The water tower is not handicapped accessible. The Water Tower is also open the first Saturday of each month, March through November. Check website or Facebook for dates and times. 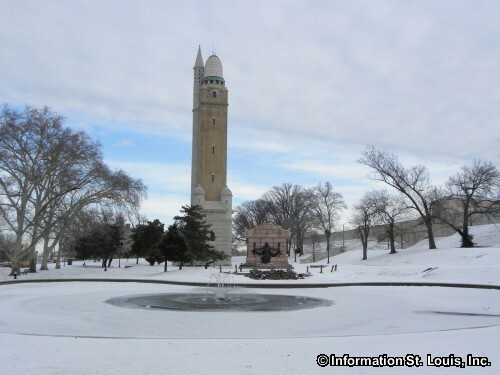 The Compton Hill Water Tower is the "newest" of the three water towers located in the city of St Louis. Built in 1898, the tower has been totally restored to it former beauty. It is located in the 36-acre Reservoir Park and is the only tower that is still accessible. On the first Saturday of each month, April through November, the Water Tower is open to the public. Visitor can climb the 198 step spiral staircase to the top of the 179-foot tower to take in the incredible views of the city of St. Louis. An admission fee is charged. Directions: Located in the Compton Hill Reservoir Park, at the corner of S. Grand Blvd and Russell Blvd, just south of I-44 in the City of St. Louis.